What are facial implants, and when are they used to enhance a patients' appearance? Many patients seek changes such as a stronger jaw, a more distinctive chin, or more youthful, high cheekbones. For some patients, these changes can be made using procedures such as submental liposuction, a sliding genioplasty, and a facelift of fat grafting. However, for some patients, their natural face shape or bone structure requires a bit of an additional assistance to achieve the significant changes that they are looking for. In these cases, our Kelowna plastic surgeon may recommend facial implants. Facial implants enhance or augment the structure of the face, either to enhance the appearance or to reverse the effects of ageing, health issues, or other circumstances. Similar to the more commonly-known breast implants, facial implants solid materials that are added to the patient in order to enhance their existing features. However, because they are being added to the face, these procedures can often be even more delicate than a breast surgery. This is why it is important to seek out a qualified, experienced, and board-certified plastic surgeon. How Do Facial Implants Enhance The Features? Facial implants add volume and definition to areas of the face that are recessed or flat, or to create more aesthetically pleasing proportion. What Kind Of Facial Implants Can Patients Get? Chin Implants - Chin implants can add both height or projection to the chin. This can create a stronger profile, or create a more balanced face shape by adding more height to the lower third of the face. This can also create a more harmonious appearance when a patient perceives their nose as very distinctive. This procedure is offered by Dr. Peterson, the lead plastic surgeon at our Kelowna clinic. Jaw Implants - Like chin implants, these add volume to the lower half of the face. However, these implants add definition to the back half of the jaw, closer to the ear. They can widen the jaw, as well as add height in order to create a squarer, more angular jaw. While a strong jaw is often popular among men, women who are seeking youthful, finely angular features may also opt for this procedure. Cheek Implants - Cheekbone implants create the appearance of more pronounced cheekbones. In other situations, cosmetic surgeons make use of cheek implants may be used to create the appearance of fuller, more youthful cheeks. 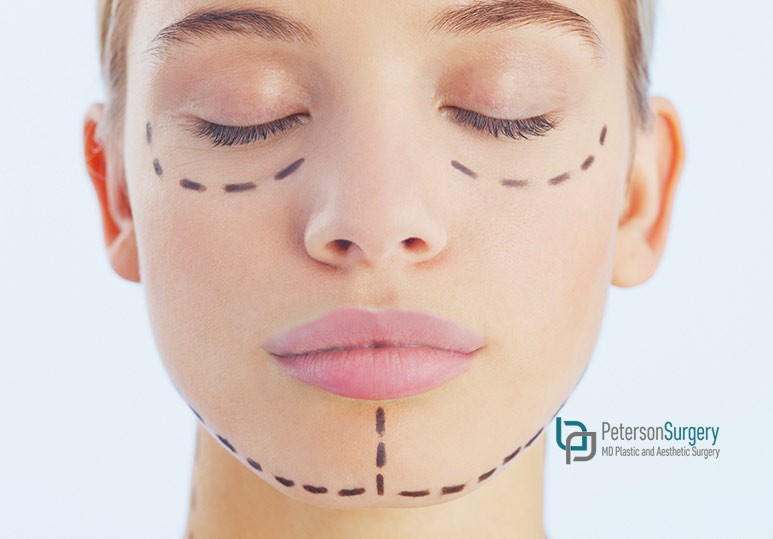 While we do not perform all facial implant surgeries at our Kelowna Plastic Surgery, Dr Peterson is able to recommend you to a colleague if your consultation reveals that an implant procedure would be the best course of action. What Is The Recovery Time For Facial Implants? The recovery time for facial plastic surgery is highly dependent on the individual, customized procedure that is chosen. Your doctor may recommend medication to take after your surgery to promote healing, as well as advise you to book time off work or reduce your physical activities. When planning a plastic surgery, it is always important to bring up any concerns you have about recovery time so that you can set aside enough time to recuperate. Are There Non-Surgical Alternatives To These Procedures? If you’re not sure if you’re if you’d like a permanent result from your surgery, or if you’d like to “test run” what fuller cheeks or a stronger jawline would look like, you may want to consider dermal fillers or Botox. Our sister clinic, Okanagan Skin Clinic, offers a wide variety of nonsurgical treatments to create more youthful, defined features. Want To Create More Defined Features? Contact Us Today! To learn more about facial implants and facial rejuvenation procedures, give our team a call at (250) 868-9099 or reach us online through our online contact form.